I sometimes wonder which is better: Writing with a plan and purpose or writing aimlessly, only clarifying one’s thoughts as one goes along. To be quite honest I do both. Sometimes alternately and sometimes at the same time. Should I ultimately chose one style over the other? Should I work at marrying the two styles? I don’t think I’ll ever be able to answer those questions. Do you feel the need to read anymore? I have always loved to read. As a child I read books, magazines, encyclopaedias and even catalogues. And as I grow older I find that I still love to read as much as ever – if not more. But I have been noticing a disturbing trend. My attention span is waning. This is an especially disturbing trend to me because I find that it is disrupting on of the most positive activities in my life. The hours and hours that I spent in rapt pleasure leisurely reading my way to slumber has given way to hours and hours in front of a computer screen only to go to bed unable to sleep and leave bed in the morning with a headache (which I refer to as “cyberburnout”). I never felt time was wasted with a book but I often feel guiltily uneasy about my time on the internet. I have a theory that this is down to the amount of time I spent at the computer. There are so many interesting and compelling pages on the internet that I find myself skimming from page to page to page. I get lost surfing. In the past when reading books my mind would wander as well but the meandering was stimulated by the information laid out or the story being told in the book. My imagination would get a work out. Now though when I read books I am feeling a disturbing trend. My mind wanders to other things often related to the book only as a starting point. My feeling is that web surfing is having a negative impact on my attention span. Or could this be from something else? On the one hand I thoroughly enjoyed this book but on the other hand I kept feeling a bit of forced guilt on the behalf of the author. 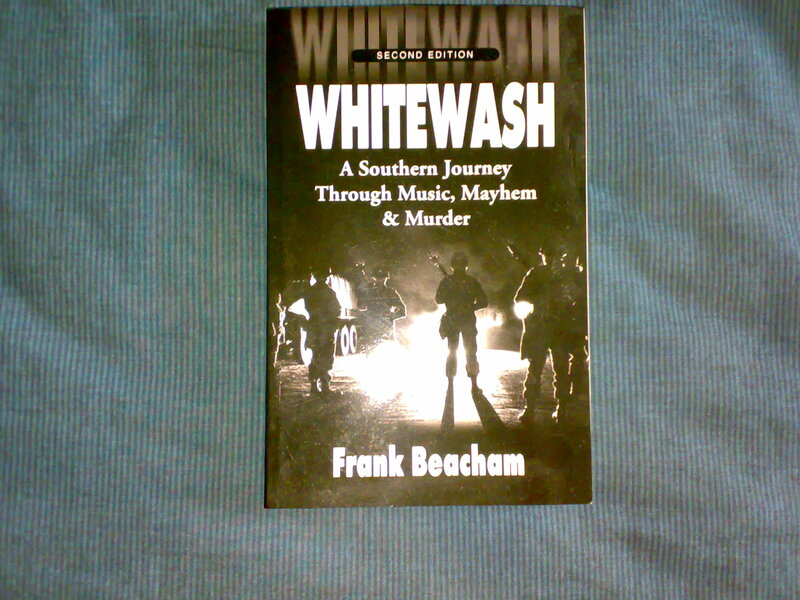 Frank Beacham was anything but a Southern apologist, which he shouldn’t be anyway, I felt the story was written to attach himself and distance himself at the same time. The stories are interesting and compelling. I’m glad I read it. Do you have withdrawals after finishing a book? Why do so many authors get withdrawal symptoms after finishing their book projects? To me when someone says they are having withdrawals I have an imagine in my mind of a melancholy feeling of unfulfillment – sort of like being denied something that was within my reach before. Again, I cannot report this on any of my writing projects. I like to think of writers giving something to the world like a carpenter or master builder does. So where does this “unfulfillment” that other writers appear to have come from? Is it self doubt? Can we equate the creative process to the high of taking drugs or drinking alcohol? And why if so many other authors seem to get it am I seemingly immune to this? When I think about the process logically one could equate it to the post partum depression that women have after giving birth, but again, not all women report this state. So I guess my blog post today is more of a question that fascinates me. Do you authors out there who have successfully completed a book get withdrawals? What do you experience? How long does the withdrawal stick around? If you experience other emotive states than withdrawal what do you experience? So you haven’t gotten offered a publishing contract after the umpteenth try. Maybe you haven’t even been able to score a good literary agent. All that effort wasted and still you just know that you have something valuable to say. You know in your heart that the world needs to know you, the world simply must know your work, and now you are nearly convinced that the only way that you can see this getting your masterpiece out is by you self publishing your work. I got ya… But you are at a severe disadvantage, you know? First of all you won’t have the resources of a major publishing house to properly design your book cover and edit your material. You won’t have major distributors out there selling your books in book stores around the globe. You won’t have public relations companies, book marketing firms and ad agencies at your beck and call. But I didn’t have to tell you that, did I? So without all of these resources and help from where will this masterpiece spring on to the waiting public? The same places all masterpieces spring from. From your own brilliance and perseverance. If you are looking for some special key I just want to let you know now that this post is not going to offer you any magic formula. I want it to be a bit more of a pep talk. I have been reviewing books for BookPleasures for some time now and have read a good many books by first time authors and otherwise unknown authors. Personally some of the best books that I have read in the past few years have been self published or authors who have published with small publishing houses for whatever reason. So you can believe me when I tell you that when I have read a good book I do my best to make sure that the world knows this is a good book. That is why I have committed myself to reviewing these books. I promote the authors in every way that I can. Ernest Hemingway originally self published under the pen name "Peter Jackson"
You see 99.9999% of all famous authors, whether fiction or non-fiction started very, very small. They were unknowns who got their fame through their persistent work. Their bodies of work had meaning and they endured. And nowadays we have advantages that the authors who published before didn’t have. For instance we more tools and resources at our fingertips than ever before. These resources allow anyone working alone can promote themselves to a broader audience. We have social media, videos, websites, blogs. It isn’t just the press releases, reviews and book signings anymore. We have much more control over our own destinies than any other time in history. The fact that you are reading this blog written by me is proof of that. I am certain that some of the people who I have reviewed already will be discovered by more and more people because they use their creativity to find their audience. A good example of one I expect to reach this summit is my friend (who I have posted about before) who goes by the nom de plume “Maclean J Storer“. Word gets out. In the old days we called this “word of mouth” but nowadays we bottle it and relable it as “viral marketing”. A great example of the word getting out is that I have a German friend who read Maclean J Storer’s Forward O Peasant and he sent an e-mail to 300 of his friends and family telling them to find this book and read it. And twice within the past month I have been asked by people where they can buy this same novel. My friend is gaining a following slowly but surely. And so will you if your work is good and you stick to it. Almost every writer who gained a large following started small with immediate friends and family – but success in writing is almost never bagging the big one. It is more like farming. Just remember what Vince Lombardi used to say: “Winners never quit and quitters never win.” It is not only true for sport but for everything in life. Write. Publish. Then get out there and promote yourself but most of all, stay at it! I know of very few people who have completed one work and can be called a master at anything. J.D. Salinger, possibly? Nonetheless, Maclean J Storer’s debut Forward O Peasant will definitely be a cult classic and underground favorite for years to come. The book has been getting great reviews in the expatriate community. But better than that, Forward O Peasant has been receiving tons of word or mouth notice from expatriates residing in Asia, but especially in Southeast Asia, many of whom have been smuggling the book into Vietnam for friends or buying pirated copies in the backpacker areas of Saigon and Bangkok. I was one of the first to have read this book (or at least I would like to think so) and have been singing its praises to all who want to listen. That having been said, I know of one German in Cambodia who e-mailed over three hundred of his acquaintances telling them to get hold of Forward O Peasant and read it cover to cover. As I have personally known the author since 1994 and since I have also tried my hand at writing humor (though in a much different format) I thought it might be good to ask him about what goes into writing humorous fiction. Gary Dale Cearley: How do you know when what you have written is funny? Where does the feeling come from? Maclean J Storer: I always had the feeling that to write something funny, I would have to surprise myself. So when I read back over a scene or a chapter and it appeared as though it had been written by a better writer than me, I felt I had probably got it right. I also make a practice of reading my work out loud to myself, and when you do that, there’s no escaping it when you’ve written something dull. Gary Dale Cearley: Where does your inspiration for writing in this particular genre come from? Maclean J Storer: This particular book was based on personal experience. All the actions in the book either happened in real life, almost happened, or I was told that they had happened, or I felt that they should have happened. My task as the author was to try to make the four types of action indistinguishable from one another. Gary Dale Cearley: Who is your favorite humorous writer out there today and why? Maclean J Storer: I like absurdist humor, and I think most of the best practitioners of that art have pretty much hung up their pens — Alan Coren, David Nobbs, Clive James, and the cartoonists Bill Tidy and Glen Baxter. Garrison Keillor is a special favourite of mine, and a fascination — I’ve never read another humorist who can be so funny yet so gentle. Gary Dale Cearley: Your first book was loosely based on your experiences in living in Vietnam where you lived for several years and I understand you are working on a sequel. After this sequel do you intend to continue writing humor about Vietnam or will you move on to other worlds? Maclean J Storer: I think two books about Vietnam will probably be enough. There are so many other targets for satire in the modern age, I think it’s time I turned my attention to the wider world. Gary Dale Cearley: What have been your harshest criticisms about the book? Maclean J Storer: I have been accused of political incorrectness and bias, which I take as compliments for a satirist. Gary Dale Cearley: And on the other hand, what has been your most positive feedback? Maclean J Storer: Many people have said that they found the book extremely funny, which is the main thing, and several others said they found it true to life, to the extent that they knew people who were exactly like the characters I had created. Gary Dale Cearley: From publishing Forward O Peasant, which was your first novel, what advice can you give to other first timers out there who are looking publish their own first book, which might be a novel or otherwise? Maclean J Storer: Make your book the best it can possibly be. And that includes mundane things such as thorough proofreading and editing, which in turn means having a third party look at your work, ideally a professional manuscript assessor. It costs a bit, but at least you will get some honest feedback and advice. When you venture forth into the world of agents and publishers, you should use every trick you know, exploit every personal contact, and twist every arm you can. And keep a handkerchief handy for crying into when things don’t work out, as will frequently happen. Gary Dale Cearley: What has writing this book taught you about yourself? 1) Do not recreate the work. Though you can give your opinion about the style of the work, in the end the final outcome should be left to the writer. Even if you feel the work is totally awful you shouldn’t rewrite it for the author. Give him some pointers but for Heaven’s sake, let him do the rewriting. 2) Don’t blow the requestor off and don’t procrastinate in getting something back. Make sure that they know you are busy even if it takes some time to get back to them. By doing so you will make them feel that you are disingenuous. 3) Be fair and civil. You can be direct and to the point but at the same time the writing is not your own. It belongs to the creator until it is in its final form. Do not use spirit crushing words when pointing out the flaws in his work. It will be a degrading experience for the both of you. 4) Simplify. I have found that if there are fifty various mistakes in a work that a friend has asked me to look over then I will try to make my comments on three or four broad general areas and let them work out the kinks. This can be eye opening for the other writer and generally pays lots of dividends for the both of you because it is a learning experience for one and a good counseling experience for the other. Win win. I can sometimes be quite harsh when looking over someone else’s work and I have had to strive for balance and understanding when asked to give opinions. Often this is because I really want them to produce something of quality. But at the end of the day it is much better to only show them the signs and let them finish the work when it is done. You are taking on the dual roles of coach and cheerleader, not judge and jury. And remember to walk that fine line: There is nothing gained by crushing somebody but at the same time if you don’t help them become better writers both sides lose! One thing I have learned as a writer, whether it is a book, article, web posting, blog or whatever it may be, is that writing in and of itself is an exploration of my mind. This is not to say that I am actively looking into my mind as I write, although that might be fun to do some time, but what I find is that almost always in retrospect I have learned something new. 3) Having the planned out or mapped out structure is one of the best defenses against writer’s block. All that having been said, during the planning process I discover so much more about my subject when I am considering all the angles of the material. Then I also notice that during the writing process itself, while I am banging away at the keyboard, my mind wonders throughout the subject matter and sometimes even crosses the borders into other subjects. I normally finish my writing not only with a sense of accomplishment (for getting the words to paper) but also a small sense of enlightenment. If you feel the same way whenever you do anything, whether it is writing a novel or pruning roses, then I say you are a lucky person. I have been involved with an authors’ meet up for some time now. It is a very off and on thing and as all groups go it has some falling outs with the members, mainly over structure of the group and what we are to do. Personally, it is very hard for writers to put much structure into any such group unless they are all of the same genre, mindset and caliber. Our group, the Bangkok Writers Guild, is a very informal group made up of mainly expatriates. Some of us are very satisfied where we are in our status whereas others want to hit it big – have a blockbuster to make their name, so to speak. Personally, I don’t feel the need to do this because the books that I have written are unique in their own right. You won’t find many books debunking the Vatican Islam Conspiracy, nor will you find many books on bawdy Southern humor either. That being said, if you plan to join such a group as ours I think you will find a great camaraderie with your fellow authors. There is much to be learned from them and there is much to teach them as well. For instance, unless you are in a major city full of authors and author wannabes, like New York City, per se, then your group will most likely be a rag tag group like ours. But this is great! We have writers in our group who are non-published, self-published, vanity published and traditionally published. The whole gamut is run in our own membership. So if one of us wants help with marketing, typesetting, illustrations, cover design, getting an agent, editing, finding a POD publisher, getting blurbs and book reviews – you name it – it is all right here in our group. For an author there is no better master mind group than a group of other authors. I have personally found a wealth of experience in our own people. If you are not in a group already and you are serious about learning the business of being an author, whether you plan to self publish or land a contract with a publishing house, I recommend finding a group to build a nest in. Participate in the discussions. Learn what you can and impart your own knowledge as well. And if there isn’t a group around you then try to put your best foot forward and start one yourself. Use the leverage of others’ knowledge and experience to make you better at the business of writing. Open your mind to it and you will see there’s lots of help out there for you. I would love to hear from other writers’ experiences in writers’ groups. Do you have any experiences you would like to share?